After the reprise of cold weather we're back to more seasonal fare now and indeed spring is springing all around us. The birds are all marking out their territories with their song and in general the world is a better place. I heard my first singing Chiffchaff of the year down in the Trap Grounds though I've yet to see any Sand Martins or Little Ringed Plovers sadly. On the floods (which are looking nice and full thanks to the recent rain) duck numbers are diminishing though we're starting to get an increase in wader activity. Recently we've had up to four REDSHANK and four OYSTERCATCHERS, a couple of DUNLIN and double digit counts of Golden Plover gracing us with their presence. 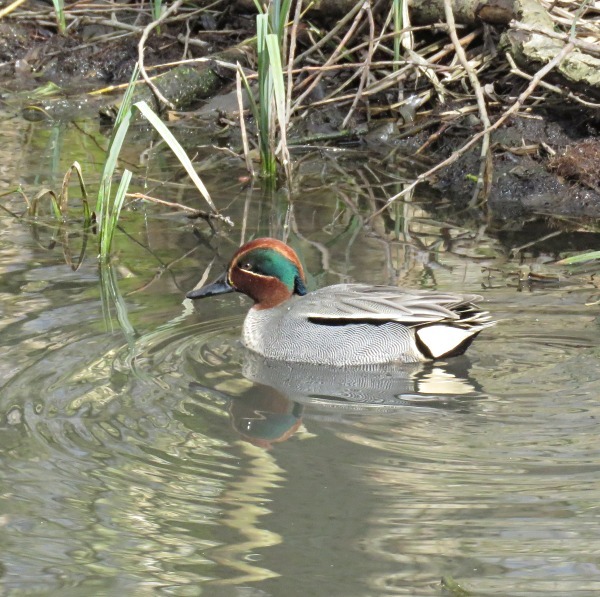 On the wildfowl front, whilst general numbers continue to decrease we've had a peak count of seven SHELDUCK, a single female PINTAIL and the first couple of GADWALL of the spring. The BARN OWL was seen regularly in Burgess Field for a while by Mary MacDougall from about 6:30pm ("old money") in the evening and indeed one evening (though earlier than this) Martin Gebauer and myself saw it fly across the floods from Medley Farm over towards Burgess Field so maybe it roosts there. However, it's not been reported in the last few days so I don't know if it's still around. The Jericho RED KITES have been rather vocal of late: I've seen three together at one time and there seems to be a pair which circle the skies together. I did the final WeBS count survey of the winter on Monday. For those interested in statistical details these were the counts. On the botany front in the Trap Grounds, the Green Hellebore is still in full flower though the Winter Heliotrope has now gone over to be replaced by emerging Butterbur flowers. Looking ahead, we've got Sand Martins and Little Ringed Plover which should arrive any time now. There's always the possibility of a Garganey on the floods as well as more passage waders. As we move into April we should start to get the bulk of the summer visitors passing through. It's an exciting time of the year just ahead!